We enjoyed our stay a lot! It was cosy and warm inside. Great view of the lagoon. All was perfect! Nice and hospitable hosts, cozy apartments, great location. A good price / quality ratio. We have been here twice, but we will be coming in the future for sure. Excellent choice for having a comfortable stay and a rest. Only the best recommendations! Egle is very friendly, supportive and helpful host, she showed everything when we arrived, tell where to buy fresh fish, etc. The rooms was very tidy and clean, IKEA style rooms, good WIFI, 5 meters from the sea, very calm and romatic place. Also it's possible to rent a bike and have a tour around. Really recommend! Splendid place to stay on Curonian Split. 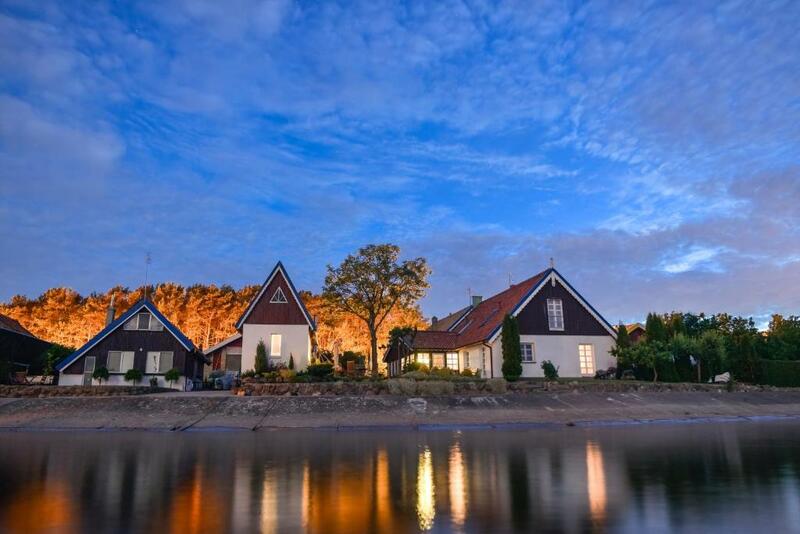 If Nida is too busy and touristy for you, then Preila is perfect as a remote getaway. Excellent location on the coast, quietness, all the necessary facilities, welcoming owners. The best thing was that view on the Haff and having every time that sound of water. The location was beautiful and Egle, the owner, was fantastic and really helpful. Nice place, on the shore of the Curonian Lagoon. Nice interior. The view is amazing as the cottage is only two steps from the sea. You have everything you need, the kitchen, bikes, etc. Very friendly and nice hostess. Peaceful village, very nice. Lock in a great price for Vila Preiloja – rated 9.6 by recent guests! One of our best sellers in Neringa! Family-run guest house Vila Preiloja is located in a quiet area in Preila village, right on the shore of the scenic Curonian Lagoon. It offers self-catering accommodations with free internet access and a TV with cable channels. The rooms at Vila Preiloja are bright and decorated with wooden furnishings. Each apartment or cottage comes with a seating area, ironing facilities and a private bathroom with a shower. Guests have use of a kitchenette that comes with every apartment. It is well-equipped and the facilities include a refrigerator, a stove, a microwave, as well as a dining area. Barbecue facilities are provided outside. A seasonal cafe is just next to Vila Preiloja while a small grocery store is 1,650 feet from the property. A café and a shop are just next to Vila Preiloja. The beach is 1.2 mi away and the center of the Nida resort is 4.3 mi away. This property also has one of the top-rated locations in Neringa! Guests are happier about it compared to other properties in the area. This property is also rated for the best value in Neringa! Guests are getting more for their money when compared to other properties in this city. When would you like to stay at Vila Preiloja? Apartment on the second floor with beautiful views of the lagoon. Facilities include: a seating area, a bathroom and a kitchen. Please note: there is an extra sleeping area with double bed mattress above the bathroom, suitable for older children. In order to get there they will have to use a ladder. Apartment on the second floor. Facilities include: a seating area, a bathroom, a kitchenette. Cottage with a fireplace and great views of the lagoon. The facilities include: a living room, a bathroom and a kitchenette. This cottage features views of the lagoon, wooden terrace and grill. We do everything that our guests will feel like at home - cozy and always welcome. Our family loves an active lifestyle in nature. And at home we like to create comfort and improve our local environment. Preila - a small and quiet fishing village on the lagoon side, surrounded by a wonderful forest. Neringa has a very good bicycles trails (Nida is 6 km distance from Preila, Pervalka - 4 km), so you can enjoy both active leisure and relaxation on the beach. Neringa - a wonderful place where you can feel yourself a part of nature. House Rules Vila Preiloja takes special requests – add in the next step! Please note that there is no daily cleaning service. Bed linens and towels are changed once in a week. Guests are kindly requested to pay a deposit. Vila Preiloja will contact guests directly with information regarding the method of payment and other relevant information. Please inform Vila Preiloja of your expected arrival time in advance. You can use the Special Requests box when booking, or contact the property directly using the contact details in your confirmation. Lovely people and fantastic place to stay! Apartment is a small hut. It is not convenient to climb upwards to the bed. It is clean, but the smell of paint or lacquer is disturbing. All windows are permanently shut. The window upstairs is open only to the small gap,which is not enough. It is a pity to inhale this synthetic material instead of wonderful air outside. Travelling in April is a bit complicated when there are no services in the village and you have to go to Nida for food or anything. Rooms were extra clean, everything was new. TV has many channels, fast WiFi is available. A grill was provided for outdoor grilling. Bicycles are available for rent. The most amazing thing is the surrounding silence and the sound of nearby water. Amazing nature nearby.